It may be a while before space elevators become a reality, but that doesn't mean it's too early to start trying. Recently, the head of Google X's Rapid Evaluation team confirmed that its secretive R&D lab actually tried to design one — but fell short on account of one major technological hurdle. It actually shouldn't be surprising that Google is thinking along these lines. A central aim of Google X developers is to improve technologies by a factor of 10 and to develop scifi-sounding solutions. Some of its current projects include Google Glass and the driverless car. And as a Fast Company article now shows, Google X has even considered the feasibility of Star Trek-like teleporters, hoverboards — and even a space elevator. Fast Company's Jon Gertner quoted Google X's Rich DeVaul as saying, "It would be a massive capital investment." But once built, "it could take you from ground to orbit with a net of basically zero energy. It drives down the space-access costs, operationally, to being incredibly low." The team knew the cable would have to be exceptionally strong — "at least a hundred times stronger than the strongest steel that we have," by ­Piponi's calculations. He found one material that could do this: carbon nanotubes. But no one has manufactured a perfectly formed carbon nanotube strand longer than a meter. And so elevators "were put in a deep freeze," as Heinrich says, and the team decided to keep tabs on any advances in the carbon nanotube field. 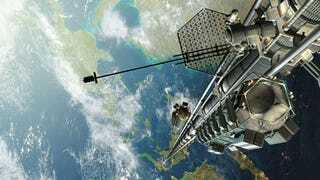 Indeed, as we've noted before, building a space elevator is a far bigger challenge than many people think.